Standard connector housing pin for use in 0.156-inch crimp-pin style housings. This connector pin can be crimped to stripped wire (22-26 AWG). Soldering is optional (but recommended in addition to crimping, for best connection). 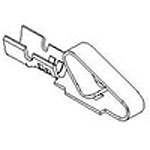 See our Wire and Connector Tools section on our Electronic Parts page for crimping tools. Can be used in place of # 08-50-0105. These 0.156" pins are considered the larger and most common type used in pinball games. Fits most makes and models.